Monaco have agreed a deal to bring in Michy Batshuayi on loan from Chelsea for the remainder of the season. Goal understands the six-month arrangement will have no option for the French side to sign the Belgian on a permanent basis, and the striker will return to Stamford Bridge when the deal expires in the summer. Batshuayi has struggled to pin down a regular place in the Blues team since arriving in west London in 2016. His defining contribution for Chelsea came when he netted the title-winning goal in May 2017 when the Blues won 1-0 against West Brom to seal the Premier League crown. On Friday Goal reported that the player's agent, Meissa N'Diaye, had travelled to the principality to discuss terms with Monaco after Batshuayi's loan deal with Valencia was cut short by Chelsea. Now, Goal can confirm that the Belgium international will join up with the 2016-17 Ligue 1 champions until the summer. Everton had been considering a bid of up £18 million ($23m) for Batshuayi given they are unable to sign him on loan. Chelsea defender Kurt Zouma is already plying his trade at Goodison Park on a temporary basis, with Premier League rules stating a maximum of one player can be loaned to another club at any one time. Batshuayi will become the second Chelsea player to move to the Stade Louis II during the January window, with Cesc Fabregas having completed his transfer on Friday. 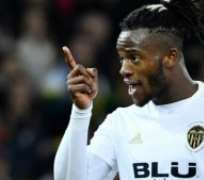 A move back to the French league could be exactly what Batshuayi needs having struggled for form during his time with Valencia during the first half of the season.